Yes. I amaze even myself with how handsome I am. But, the way things are going, I’m not going to stay that way for long. Gotta find me a groomer who can do my face just so! Still looking. This entry was posted in The Scottie Chronicles and tagged dog grooming, dogs, pets, Scotties, Scottish Terriers. Bookmark the permalink. WE are off to the groomers this morning. Too bad you don’t live in NY, you could come with us!!! Yes, you are one handsome Scot! That reminds Mom, she needs to make an app’t for moi to get my head and leg furs done. I’m getting a bit scruffy. Andy’s furs grow a bit slower so he doesn’t get tortured quite as much. Your Pic belongs in the Louvre next to Miss Mona. P.S. Happy Dog Day to you and all your furiends at the Chronicles! Say….this is a pawsitive story for you. It’s terrible to have to change hairdressers. We feel for you. 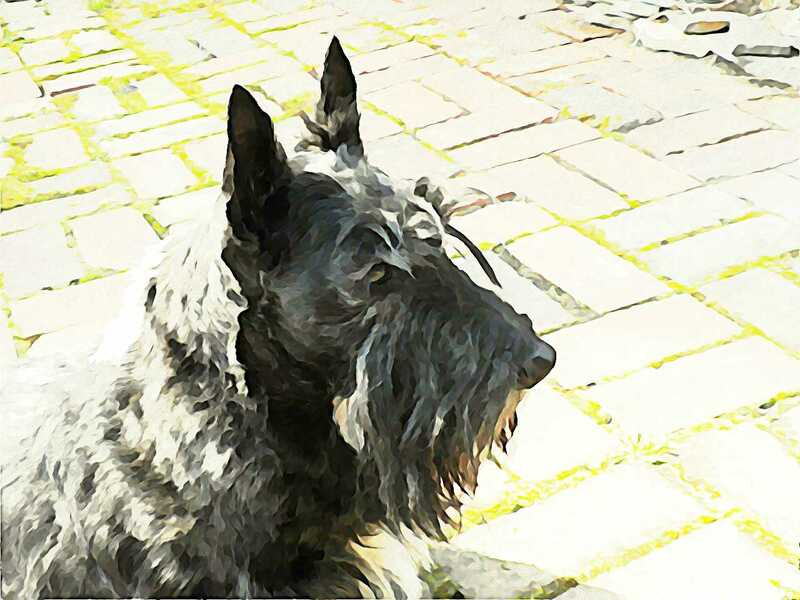 You might want to try Custom Canines in McLean, Va….they are excellent my Scottie been going there for 4 years and always looks great, also my daughter brings her scot from Baltimore there. You could come for lunch! Make a day of it! we think you look just pawfect! Time for mom to learn to do it. She have Stu’s beard in curlers. You gotta kiss yourself you’re so pretty! We think you are a perfect example of the Scottish Terrier breed. Great head, eyebrows, beard, and a cute tush! You could have done the commercial for Scott’s Lawn Seed – your handsome looks and stunning personality would have shown your great attributes! You’re just such a natural, Stuart, you should feel very proud! Don’t you love those commercials!